Ever since I saw it, I have been wanting to make/eat it and when I have a craving, I won’t stop until I have it. So I finally got to make it and I found a really simple recipe with ingredients I already had at home. 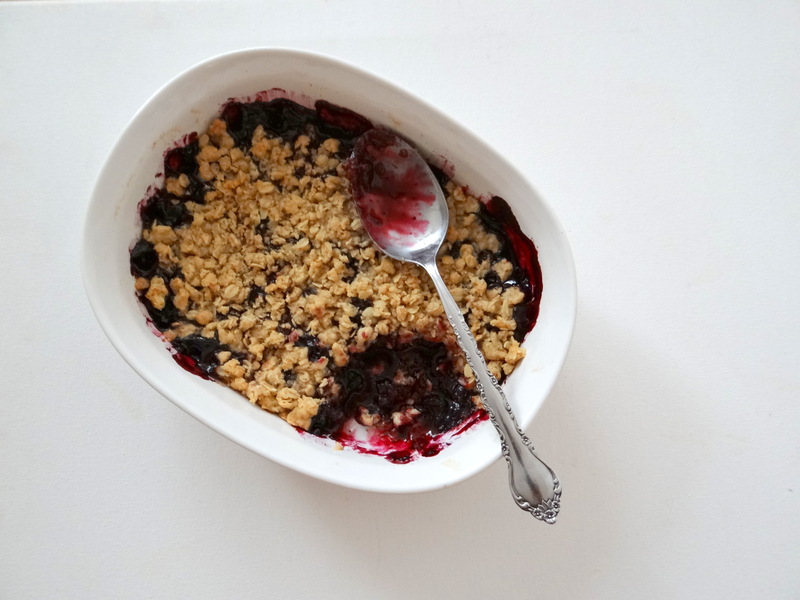 The blueberries get really juicy and sweet and it balances out with the crumble on top. It’s best to serve hot and a scoop of vanilla ice cream wouldn’t hurt. Thanks to @meatballssmama for the inspiration! 1. Preheat the oven to 375°F (190°C) and adjust the oven rack to the middle position. Generously butter a 9-inch pie plate. 3. Stir together the flour, oats, brown sugar, vanilla, and salt. Blend in the butter with your fingertips or a pastry cutter until well combined. Crumble the topping over the berries in large clumps. 4. Bake the crunch until the berry filling is bubbling and the crunch is set and browned in places, 25 to 35 minutes. Let the crunch cool slightly, but only slightly, before spooning it onto plates or into dishes and serving it warm with a scoop of ice cream plopped on top or on the side or even on the bottom (see LC A La Mode Note above). Previous PostDelish Thoughts featured on The Savory!